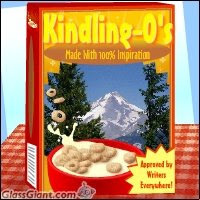 At seven I was enchanted by the world of O's, flakes, crispies and crunchies. I knew the commercials: "Kookoo for Cocoa Puffs," and "Silly rabbit, Trix are for kids," and all the characters: from Yule Gibbons, the Granola Nuts man, to the ghostly Boo Berry. I had a method. I'd eat all the cracked, sugar-filled raisins from my Raisin Bran, and leave the flakes. Or I'd pick out the marshmallow bits of Lucky Charms, loving the pink hearts, yellow moons, orange stars, green clovers, leaving the beige nubs. It was a major event when the TV Leprechaun announced, "And new blue diamonds!" Reading the box ads and gimmicks was the first entertainment of the day. To lean over a bowl of Captain Crunch, say, spooning all the crunchberries, offered a drowsy, cartoony way to wake up. And if you got a prize in your cereal - a green plastic ring or a pink finger yo yo, life was tasty indeed. What about you? What memories does cereal evoke? Pour a bowl of the kind you loved as a kid. See what happens.